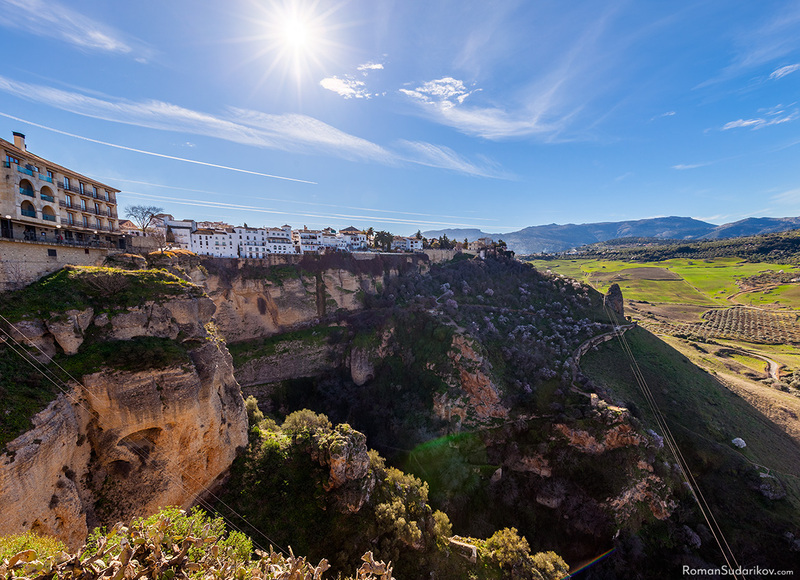 The highlight of this year’s trip to Spain was unquestionably a daytrip to Ronda, which is a mountain town about a hundred kilometers away from Málaga by car in the west direction. It is famous especially for its long bullfighting tradition and spectacular landscape dominated by a hundred-meter-deep El Tajo gorge, that cuts the town in two parts, with an old bridge Puente Nuevo crossing it. Nowadays it is also well known for its wines and other local food products. Since my last time in Ronda has passed already over ten years and I have been thinking about visiting it again for a while, so as a good ending to our vacation in Spain we decided to go on a one-day road trip there. We left from Benalmádena a bit after eight o’clock in the morning and arrived at Ronda a bit before ten. The journey took us through a steep mountain landscape, along a road with an abrupt fall on one side and limited by a rock wall on the other. Needless to say that scenery was magnificent, but even more so when we got a bit higher, the Gibraltar and the coast of Africa on the horizon added a lot to its beauty. There was a lot of rest areas along the road, but I somehow managed to have enough patience not to take any pictures, because we wanted to get to Ronda as early as possible, so that we could have more time at the destination without having to drive back after it gets dark. I recorded those landscapes only on the way back, hence the picture taken right before sunset showing both coasts of Mediterranean Sea is at the end of this article. As we approached Ronda from the east side, it didn’t look any special at all, whereupon I even doubted for a moment my memories from the previous visit, which however soon turned out to be needless concern. The town is situated on the cliff in the middle of a highland surrounded by mountains. The east side of the rock, on which Ronda is built, is gently sloping, so the newer part of the city has spread this way. The old town is on the west side where the rock is steep as a wall of a building. To get there, first we had to drive through the new part of the town. The car can be parked conveniently in the underground paid parking (Parking Martínez Astein) located at the west end of the main street. From there we continued by foot along the shopping street leading to the old town. Some of the shops were still closed and some were just opening, that is to say, arriving at ten o’clock was the perfect timing so we could start exploring the city with a second breakfast first. After stopping for a moment in the near bar to get a coffee with a toast and then continuing forward along the same shopping street we arrived at a small square with bullfighting ring, Plaza de Toros de Ronda. The entrance fee to the bullring was 7 euros per person, which also included access to the museum housed inside of the round part of the bullring behind the stand. In addition to having on display a lot of different bullfighting regalia such as outfits, posters and bull heads, there were also two other exhibitions, one of which was dedicated to equipment used by the Royal Cavalry Order of Ronda, which is “Real Maestranza de Caballería de Ronda” in Spanish, and the other one was a collection of antique firearms from 17th to 19th centuries. For me the most fascinating part of the museum was the collection of historical outfits, all of which had extremely detailed decorations. In its entirety, the museum gave a very good insight into the history of bullfighting. It is often said that the bullring of Ronda is the biggest in Spain. This is not entirely true, or at least if it is judged purely by the number of spectators it can host. What this claim is actually referring to is the size of the ring itself. 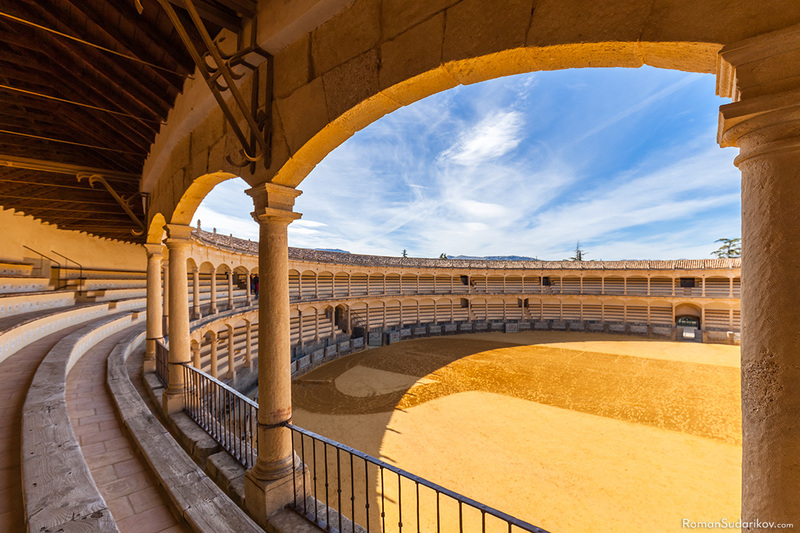 Plaza de Toros de Ronda has the largest round circle of sand in the world, which is 66 meters in diameter. The number of seats is 5000, which is for example only one fifth of what Plaza de Toros de Las Ventas in Madrid can fit. Other inconsistency I came across is that depending on the source the Plaza de Toros de Ronda is said to be built in 1784 or 1785. 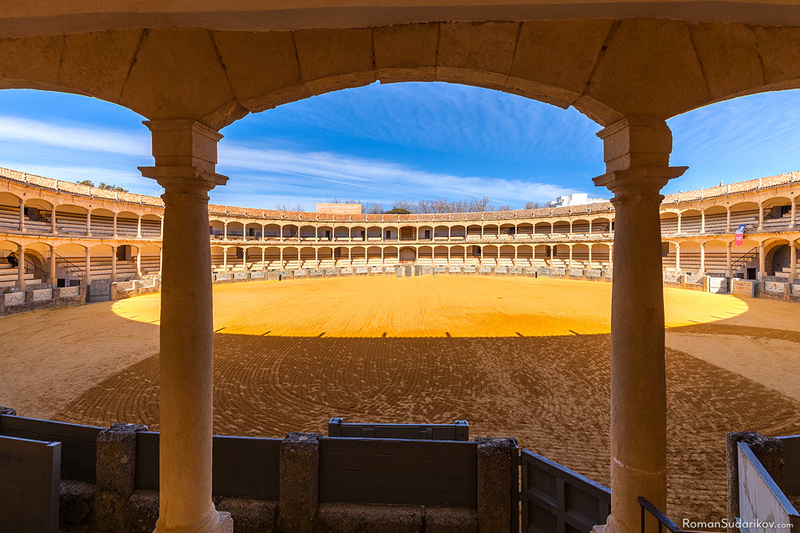 This contradiction is caused by the historical fact that after the first inaugural corrida in May of 1784 the bullring had to be closed for repair due to a collapse of a part of the stand, until it was opened again a year later in May of 1785. Regardless of the conflicts in numerical information floating around, I can confirm with full certainty that the numerous descriptions praising the beauty of bullring in Ronda are all true! Just outside of the arena there is also a viewpoint named Mirador de Ronda, from which you can admire olive plantations and fields that spread out down in the valley in front of the city and are surrounded by the mountain range far on the horizon. This time we only stayed in Ronda itself, but in the mountain area around it there is also a lot of other places worth visiting, like for example farms and vineyards, where you can explore local products as well as other Andalusian white villages, each of which surely has something unique to offer. 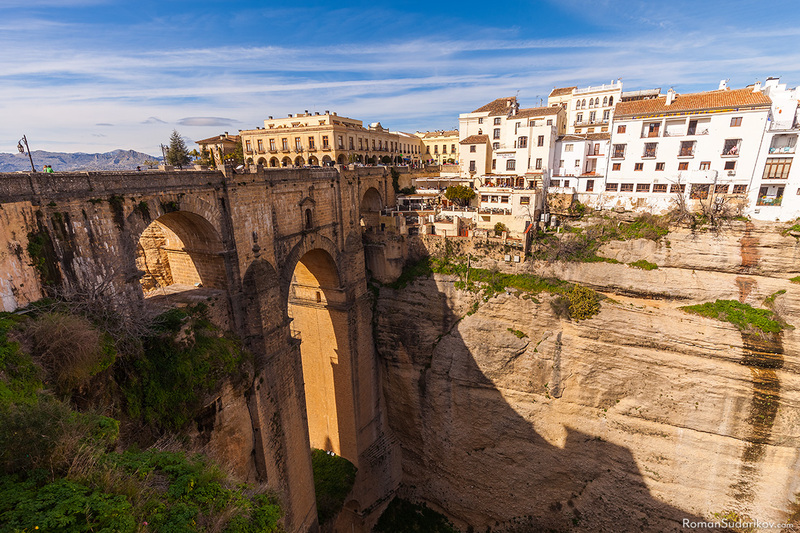 From there, after continuing in the south direction, or to the left if you are coming from the shopping street mentioned before, we arrived at the Ronda’s most famous landmark, Puente Nuevo, which literally means “New Bridge”. Despite its name, it is not so new anymore. 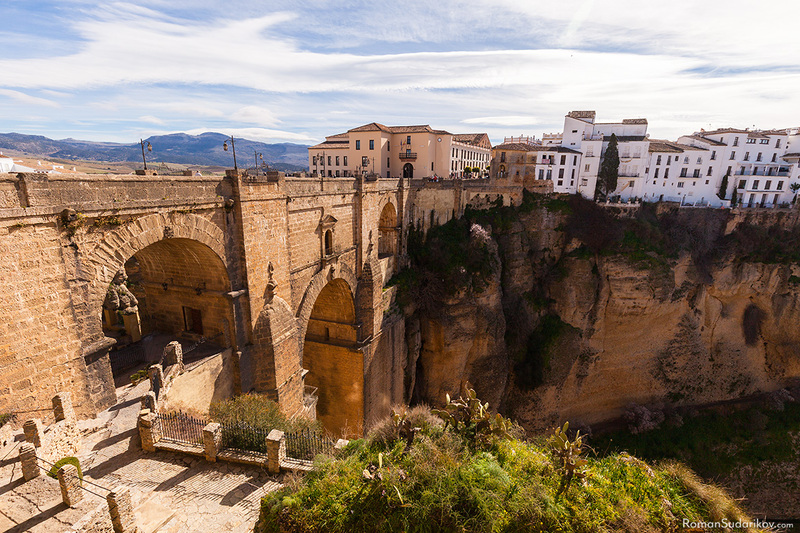 The construction project has been started already in 1751 and after taking 42 years to finish, the bridge, crossing over the El Tajo gorge to connect the old and the new parts of the town, was completed in 1793. I think that a good way to describe the landform of Ronda would be to compare it with a ramp cracked in the middle. At the bottom of the crack, or El Tajo gorge, flows The Guadalevín River. The river used to be wider and it was possible to travel it by a boat, but nowadays the agriculture is taking a lot of its water. The bridge that we can see today is actually not the first attempt to connect two cliffs in this place. The first 35 meters wide bridge over a 100-meter-deep gorge was completed in 1735. It was poorly built and had only one arch design instead of three arches of the current one, which turned out to be insufficient when the bridge collapsed during the flooding of the river in 1741, only six years later after its completion. For a fee of two and a half euros you can visit a museum located inside of the bridge itself, but there is nothing else than just a video presentation about its history, which, despite being a very small amount of money, feels overpriced when I compare it to the two other outstanding Ronda museums that we visited. I was hoping for a bit more! On the other hand, if you want to take pictures, I think it is well worth it, because form there it is possible to get one more perspective which is quite different from what most of the people take. Despite of high fence, the lower deck allows to photograph the bridge and the gorge from a low enough angle to emphasize the foreground. The next picture is taken there, but getting similar wide view requires a bit of work. The picture has over 180-degree view angle, which I achieved by combining four separate shots. Getting it with just one exposure would require some kind of special camera. Or maybe I am forgetting here all the modern mobile phones with almighty panorama functions! 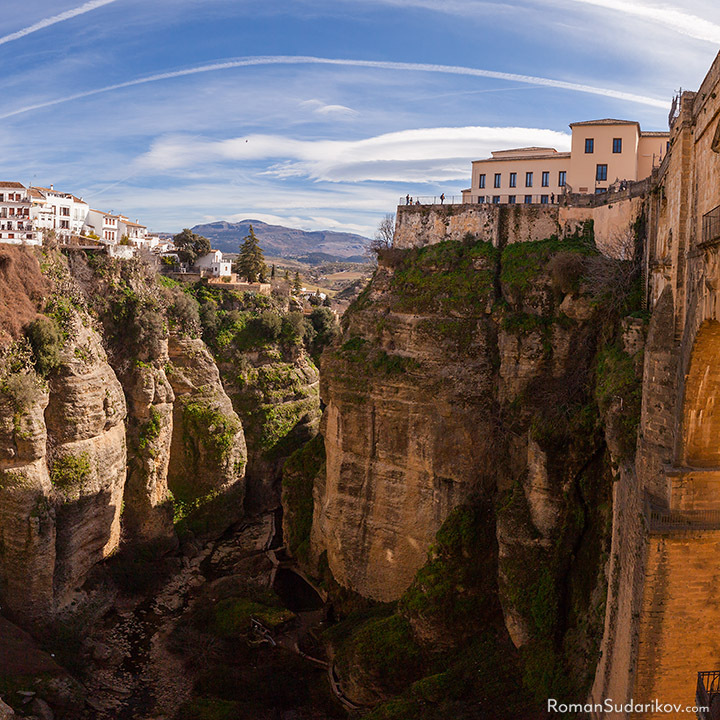 It is hard to move fast forward in Ronda if you are excited about taking pictures. Immediately after the bridge there is a next viewpoint. Luckily this time the fact that I was in a group of four kept me in check. The day before the trip I was worried about what kind of weather we would get from the standpoint of photography. The forecast was saying that it would be cloudy. However, the weather was on our side and it ended up being sunny throughout the whole day. The slight cloud cover softened the light just right amount, making the shadows not so pronounced as I would normally expect from pictures taken in the middle of the day. I couldn’t hope for any better weather! When traveling to mountains there is still need to take into the account that the air temperature in elevated areas is always lower than down on the coast. To cope with that I added an extra fleece layer under the jacked. By the end of the day the weather got warm enough to take it off. In the next picture, taken in the direction away from the Puente Nuevo, a bit further you can see another smaller bridge which is Puente Viejo, or “Old Bridge”. Its construction dates back to 1616. A bit before it, on the right, is La Casa del Rey Moro which translates as “The House of the Moorish King”. Despite its name the Moorish king has never lived there, as the house was built only in 1709, over 200 years too late for its name to be true. The palace is well known for its hanging gardens, which were added to the complex in 1912, and also for being the entrance to one more very famous attraction of Ronda, “La Mina de Agua”, the direct translation of which would be “Water Mine”. Starting from there about 300 steep steps will lead you to the bottom of the gorge. The cave was built in the beginning of 14th century by Cristian prisoners at the behest of Moorish king for the purpose of supplying water to the city during sieges. 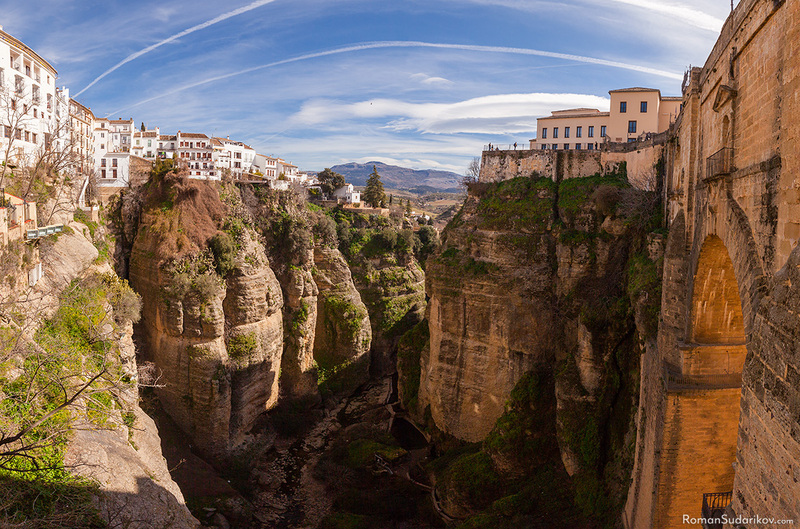 I still haven’t been to both of those places, but they are on my must visit list for the next time I’m in Ronda. A bit further, unfortunately outside of the vision provided by the picture below, there is actually one more bridge, Puente de San Miguel, or “San Miguel Bridge”, which is quite often also called by its older name Puente Árabe, or “Moorish Bridge”. This bridge, and not the Puente Viejo which name might easily lead to incorrect conclusion, is actually the oldest one of the three bridges over the El Tajo gorge. It has been repaired many times, but presumably it is originally from around the 11th century. At this point of the trip we went to get something to bring back home and to have a lunch. 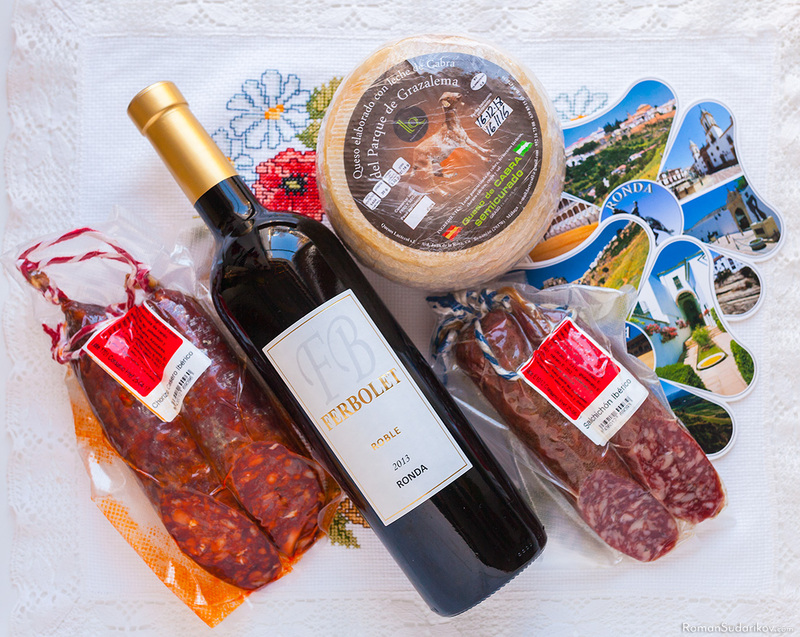 We bought some local products in the small shop right after the bridge: a bottle of red wine, goat cheese and two types of sausages, Chorizo Casero Ibérico and Salchicón Ibérico. In the restaurant, a bit forward from there, I tried the local beef specialty and red wine. The sausages we brought from Ronda were really good and didn’t survive for long. Unfortunately, I didn’t get the chance to taste the cheese, because it ended up being a homecoming gift. Both the wine in the restaurant and the one we brought with us, which can be seen in the picture below, had very original taste in my opinion, which might be just because I’m not a wine expert, nor have tasted a lot of different ones, but I can say that I liked it. The taste was very soft, but simultaneously it had something strong in it, which I wouldn’t expect. After the lunch, we visited one more museum, Museo Lara. The museum had very wide range of exhibits such as antique cameras, old phones and other technical equipment, clocks, dolls, different types of decorative items, weapons, torture tools, which might be too much for some sensitive visitors, archeological findings of the area and so on. The diversity of the museum is due to the fact, that it was originally a personal collection. The entrance fee was 4 euros and I can strongly recommend it. On a hot summer day, it could also provide much needed escape from the heat for a moment, which will help get refreshed and regain strength before continuing the trip, albeit it is not the only one adequate place for this purpose. 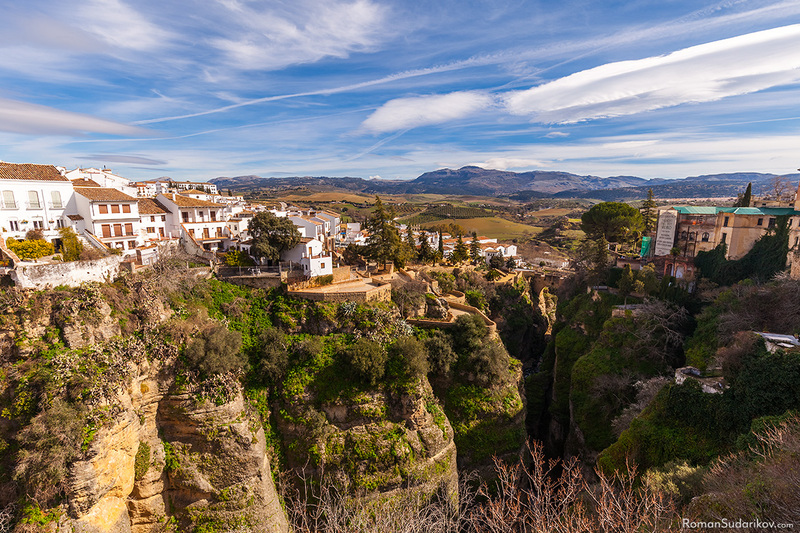 For such a small town, Ronda has a remarkable number of museums and other sightseeing locations. When I was observing the surroundings from the top of the cliff I noticed people walking in a lot of interesting places which should definitely provide very different pictures from what I got this time. I consider this trip as a good introduction, or memory refreshment from the previous time, and would like to visit this lovely and vibrant little town again with an overnight stay, but this time we had to drive back. On the way home, we made a short stop to take pictures. In the next picture on the right you can see the rock of Gibraltar, and the coast of Africa at the horizon. After finishing this article, I realized that during the trip I should had taken also other types of pictures than just landscapes. Next time I travel somewhere, I must take that into account, but this time I blame the too beautiful scenery of Ronda, which stole all my attention. More about this trip to Spain you can read in my previous article Costa del Sol in winter – Benalmádena, Fuengirola, Torremolinos. The pictures from Ronda and from this trip in overall can be seen in the album Spain Winter 2017. 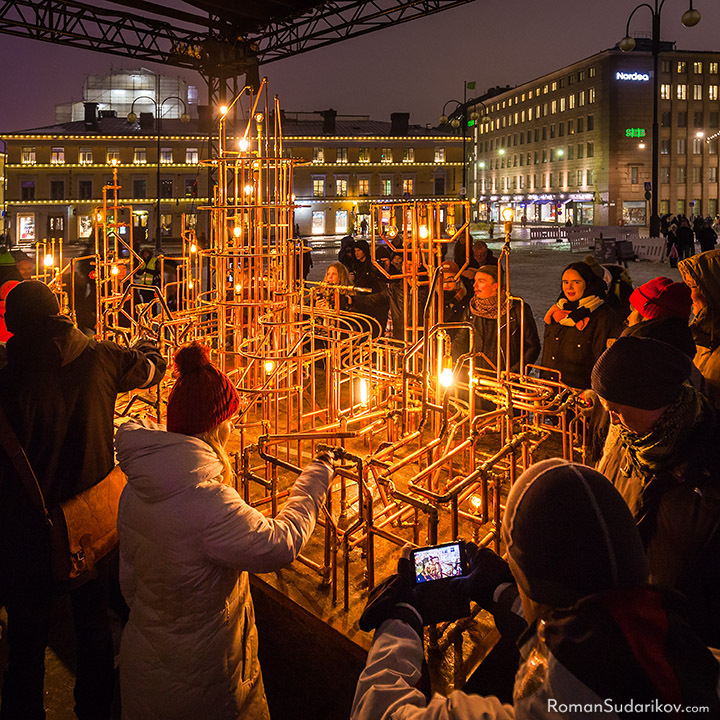 This article is also available in Russian Ронда – Город Скрытый Горами and Finnish Ronda – Vuoriston Kätkemä Kaupunki. This winter, a bit over two weeks I spent on the southern coast of Spain, namely Costa del Sol. 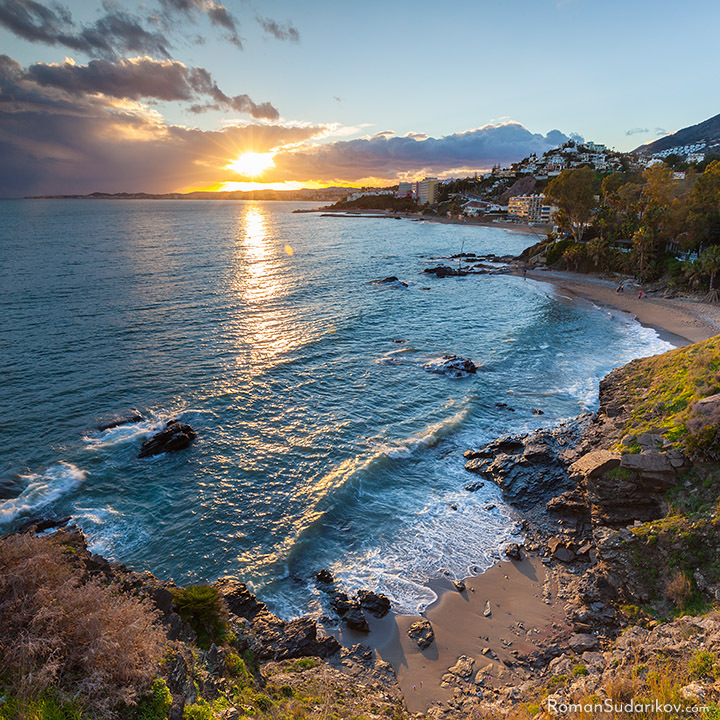 Costa del Sol is mostly known as a summer holiday destination.